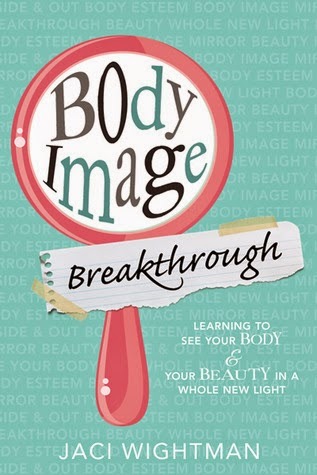 Body Image Breakthrough is a short but powerful exploration of the concept and real-life implications of good and bad body image, communicated in the language of LDS Church doctrine and faith. Wightman uses scriptural stories from Shadrach, Meshach and Abed-nego's refusal to bow down to Nebuchadnezzer's statue to the Fall of Adam and Eve to illustrate how our modern culture sets us all up, though women and girls in particular, to worship the idol of outward appearance and to feel destructive shame when we don't measure up. The book is full of quotes from General Authorities and other Church leaders, Christian speakers and authors, and scientific experts that point out the emptiness of that almost ubiquitous idolatry. Wightman ties in the money-making motivations that drive the fad diets, fashion magazines, beauty products, weight loss companies, supplements, and specialty foods. She points out the unrealistic nature of the photoshopped images presented to us everyday and the vast efforts made to get us to feel we need to look that way as well. At best, all this emphasis on outer appearances is a huge distraction; at worst, it can lead to life-threatening medical and emotional conditions. Stripping away all the noise, Wightman boils it down to the most essential truths. Our ultimate goal is to stop heeding all the voices shouting at us to eat this way or that way, and to turn to the Lord for the truth we need most...One of the most important things I learned is that there's a sacred middle ground that exists between the extremes of body obsession and body neglect. It's a place of peace, a place of balance, and a place of incredible freedom...The only way I can be free is to embrace the real me. Unlike many well-intentioned books or articles that address this topic, there is not a single word in this book about the hemline or neckline version of "modesty." Not a single one! Instead, modesty is demonstrated to be a characteristic that comes from the heart and follows naturally from a healthy sense of self-worth and value. Rather than using our body "as currency to win people over" by dressing a certain way - seeking approval or acceptance from others either by deliberately flaunting our bodies or by strictly following "modesty" guidelines - we should be glorying in the natural beauty and diversity of our bodies and finding our value in our intrinsic worth. ...take a look at the earth around you. You'll find not a cookie-cutter plan but an incredible amount of diversity in God's creations. Rather than boasting one look, one climate, or one landscape, each part of the world possesses its own unique and individual beauty...the earth stands as a witness that our Redeemer treasures beauty in many different shapes and forms. I appreciated her chapter on fasting, a gospel principle I still struggle with. At first I was concerned. Encouraging someone who is already obsessed with their weight or body image or, heaven forbid, an eating disorder, to fast is not a good idea! But Wightman's take is much more all-encompassing than the standard twenty-four hour fast from food on the first Sunday of the month. It's "separating ourselves from the things of the world. It's about doing all we can to stifle the voices in the great and spacious building." It includes abstaining from anything that is causing us to sin or distracting us from our ultimate goals. And I love that she emphasizes how individual this type of fasting is. It may mean fasting from media that promotes a false ideal of beauty, cutting up credit cards for certain stores, averting your eyes while going through the checkstand, or even avoiding specific foods that have become an obsession for you. This isn't a book to just read. It's a work-in-progress-you've-got-to-put-effort-in kind of book, too. Each chapter ends with a section of questions for personal introspection and investigation, pointing the reader back to the scriptures and to prayerfully consider personal applications, individual ways to peel back a layer of false beliefs about oneself and one's worth, and always pointing back to Christ. As [Christ] teaches us--through prayer and pondering and time spent with Him--to see ourselves the way He sees us, we'll soon view our bodies very differently, not because our appearance has been altered or our trials have disappeared but because our inward thoughts and feelings have dramatically changed. Ultimately, what Jesus Christ is offering us is rest--rest from the pressure to conform to the image, rest from our insecurities and fears, and rest from the lies that have run rampant in our heads. To be at rest is to be free of anxiety, to be at peace both body and spirit...It's a rest obtained not by reaching our goal weight or by fitting ourselves to the image but by finally embracing who we are as women of Christ.